Social Responsibility is inculcated through involvement in matters that require solutions. IFIM Business School lays great emphasis on creating all-rounder’s for which Social Responsibility plays a major role in crafting a responsible learner. IFIM Business School has crafted an initiative called the Social Immersion Program (SIP). The Social Immersion Program sensitizes the students on the needs of the community and to identify their social problems through research. 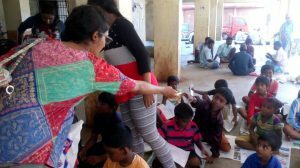 For the most recent project, IFIM partnered with CRY – Child Rights and You, which is an Indian NGO that works to ensure the Fundamental Rights of underprivileged children in India. CRY and IFIM mirrored the aim for the children, including access to free and quality education, primary healthcare and safety from violence, abuse and exploitation. They also work towards reducing the rate of child malnutrition and make sure children’s voices are recognised in issues that affect them. The objective was to create a wider pool of awareness of CRY’s initiatives, primarily to corporate houses and raise funds through various fund-raising activities. Their project was to raise capital and register people for the Corporate Football Tournament. The aim of the project was to enhance the social skills and enable them to know more about such events. A majority of students in villages are dropping out of school in order to join the labour force. IFIM students wanted to make a small change in this and thus, this project was primarily based on the importance of education where the students were directly involved in teaching children. The students of IFIM Business School were very enthusiastic and excited about the projects. They displayed compassion and commitment and we are very proud of them for the work done.